How to get there From the south the climb starts in Dont (941m) if coming from Passo Duran (1601m), or just south of Forno di Zoldo (814m) if coming over the Passo/Forcella Cibiana (1533m). If one has not arrived via another pass, the climb starts already down in Longarone (470m) (as it did in Giro d’Italia in 2006) and which is the hardest alternative. From the north the climb starts at Selva di Cadore (1311m) or from Caprile (995m). 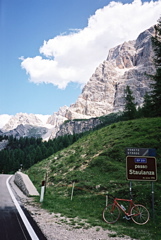 The direct road from Caprile was closed for traffic in 2006, so one had to go via Colle S. Lucia with 130 extra height metres. Other comments There is a restaurant/bar at the top of the pass. There is water on the way on the north side and probably at some places at the south side too. A very nice area.